The Cloverfork Museum was established in 1995 in hopes of giving all a glimpse into a way of life that only a coal miner in Eastern Kentucky and his family can relate. This was the former Jack Taylor home, located six miles above Evarts on Hwy. 38 at Highsplint, Harlan County, Kentucky. This home which was built in the 1930's was donated by Mr. Duane Bennett of Manalapan Mining. The house is furnished with dated/antique furniture and has two buildings filled with mining artifacts, memorabilia, a solid copper moonshine still on display and numerous pictures of our community along with surrounding communities. brothers. The Louellen community has a reunion at this same time and would like all their former residents to come join them. 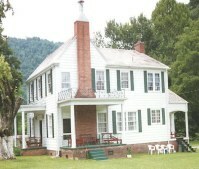 If you would like more information about the Cloverfork Museum or the reunion please contact us.